Written By: Mayim Bialik, Ph.D.
Mayim Bialik was the child star of the popular 1990s TV sitcom Blossom, but she definitely didn't follow the typical child-star trajectory. Instead, Mayim got her Ph.D. in neuroscience from UCLA, married her college sweetheart, and had two kids. Mayim then did what many new moms do-she read a lot of books, talked with other parents, and she soon started questioning a lot of the conventional wisdom she heard about the 'right' way to raise a child. That's when she turned to attachment parenting, a philosophy and lifestyle popularized by well-known physicians like Dr. William Sears and Dr. Jay Gordon.To Mayim, attachment parenting's natural, child-led approach not only felt right emotionally, it made sense intellectually and instinctually. She found that when she followed her intuition and relaxed into her role as a mother instead of following some rigid parenting script, both she and her children thrived. Drawing on both her experience as a mother and her scientific background, Mayim explores the major tenets of attachment parenting, including: Co-sleeping: How to avoid 'sleep training' and get a great night's sleep for the whole family. Breastfeeding: Learn how to listen to your baby's cues rather than sticking to a rigid schedule-and why people on airplanes love a nursing mother. Baby wearing: How to 'wear' your baby in a sling or a wrap to develop a closer bond with your child-it's possible even for mamas with bad backs (and with big babies)! Gentle discipline: How to get your child to behave without yelling, threats, or time-outs-it really can be done. 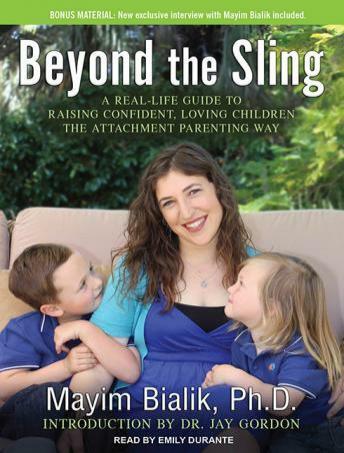 Mayim describes the beauty, simplicity, and purposefulness of attachment parenting, and how it has become the guiding principle for her family. Much more than a simple how-to parenting guide, Beyond the Sling shows us that the core principles underlying attachment parenting are universal and can be appreciated no matter how you decide to raise your child.